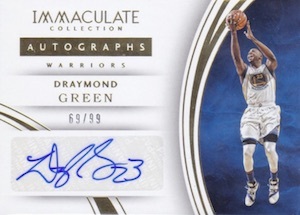 Now a high-end regular for the card company, 2015-16 Panini Immaculate Basketball largely continues to offer the same things that made it a preferred option in the premium collecting world. Every box totals five hits. 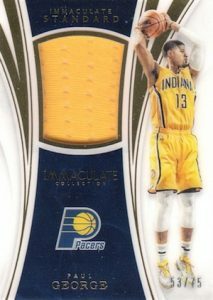 2015-16 Panini Immaculate Basketball does include one base or base parallel in each box, but that is not why you are here. The many quality hits featured are among the most popular each year for good reason. 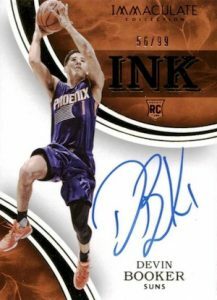 This includes the Rookie Patch Autographs (RPA) for the key first-year players like Rookie of the Year Karl-Anthony Towns or runner-up Kristaps Porzingis. There are also one-of-one Logoman versions. 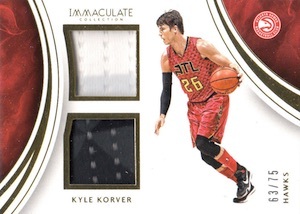 Extending the signed relic concept to veterans and retired players, Premium Patch Autographs showcase an impressive jersey swatch and on-card signature. 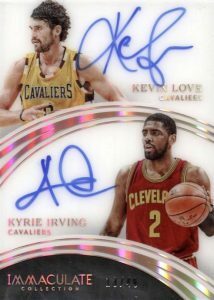 Dual Autographs, Triple Autographs and Quad Autographs increase the total players per card with hard-signed options that include former teammates or players from the same draft class. 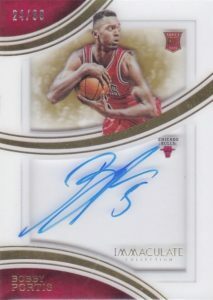 However, 2015-16 Panini Immaculate Basketball is not just about the autographs. Memorabilia cards are also a huge aspect of the set, including Nameplate Nobility with full jersey letters. Sneak Peek showcases a jumbo piece of sneaker while Sole of the Game and Sneaker Swatches are other shoe-inspired inserts. 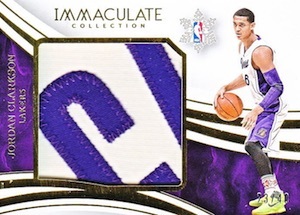 Christmas Day only features relic pieces from the NBA games played on December 25, 2015. PARALLEL CARDS: Bronze #/49, Blue #/10, Platinum 1/1. 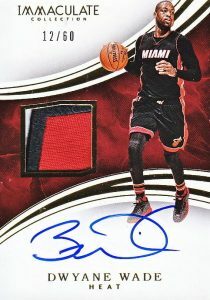 PARALLEL CARDS: Jersey Number #/55 or less (No card #128,133,137), Red #/25 (No card #133,137), Logoman 1/1. PARALLEL CARDS: Bronze #/75 or less, Red #/25, Blue #/10. PARALLEL CARDS: Red #/25, Blue #/10. 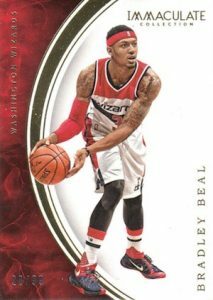 PARALLEL CARDS: Jersey Numbers #/25 or less. 49 cards. Serial Numbered #/75 or as noted. 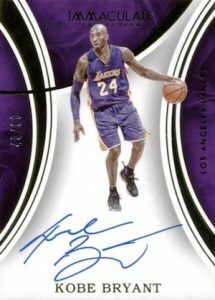 PARALLEL CARDS: Prime #/25, Platinum 1/1. *Card #50 only found in parallels. 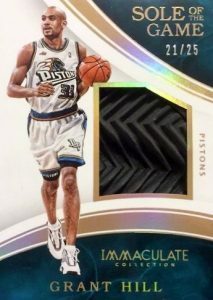 PARALLEL CARDS (No card #6,19): Prime #/5 , Platinum 1/1. 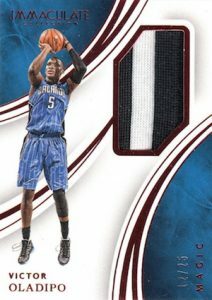 PARALLEL CARDS: Jersey Number #/91 or less, Tag 1/1. 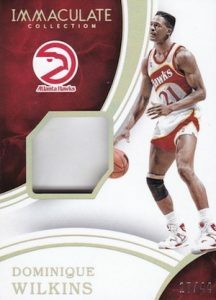 PARALLEL CARDS: Jersey Number #/91 or less (No card #21,29), Tag 1/1 (No card #24). PARALLEL CARDS: Gold #/10 (*Card #39 not included), Platinum 1/1. *Cards #75 and #100 found only in Platinum Parallel. 9 cards. Serial Numbered #/2. 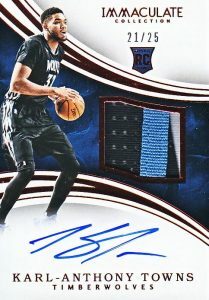 2015-16 Immaculate Basketball Hobby Box Karl Anthony Towns AUTO RC ? ?